“The Klamath watershed drains an area the size of New Jersey,” with that said it is hard not to believe that the Klamath River is the second largest in California only to be outdone by the Sacramento River. 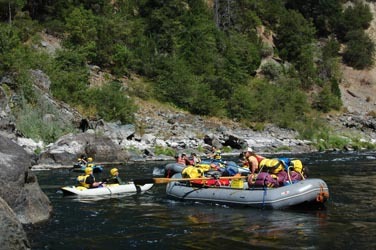 With all its majesty, brilliance and water the Klamath makes for a spectacular multi-day whitewater voyage. Hundreds of miles of class II-III rapids and calmer sections allow for all kinds of whitewater craft to maneuver through this river canyon. Starting in Oregon, just east of Crater Lake, the water from two lakes (Klamath and Ewauna) flow in to one river and head southwest through the Cascade Range. This is where the class IV Klamath whitewater run is located. The Klamath drops into California near the town of Yreka and from there 184 miles of river eventually meander to the Pacific Coast south of Crescent City. Besides the vast amounts of water that form the Klamath headwaters, this giant river is also supported by five ranges suitably named, of course, the Klamath Mountains. Snow melt contributions from the Marble Mountains, Salmon Mountains, Scott Bar Mountians, Siskiyous, and Trinity Alps keep the Klamath flowing to the Pacific year round and create a prime habitat for salmon and steelhead. With so much water pouring into the river from various streams and tributaries, the opportunity to hike to waterfalls and swim in the warm water might get a little confusing and make you feel like you’ve been transported to a tropical rain forest in Maui. But once you make your way back to the river and see the black bear, eagles, river otter and deer, the most widely seen creatures along the river’s edge, you’ll know you’re in California again. The dense foliage supports a varied ecosystem and it is no wonder that the Klamath River is designated Wild and Scenic, part of California’s protected waterways.